ScanMars is an Italian experiment that was used to identify subsurface water features in the Mars-like Dhofar region of Oman during the AMADEE-18 analogue mission in February 2018. The results have been presented by Alessandro Frigeri of the Istituto Nazionale di Astrofisica (INAF) at the European Planetary Science Congress (EPSC) 2018 in Berlin. 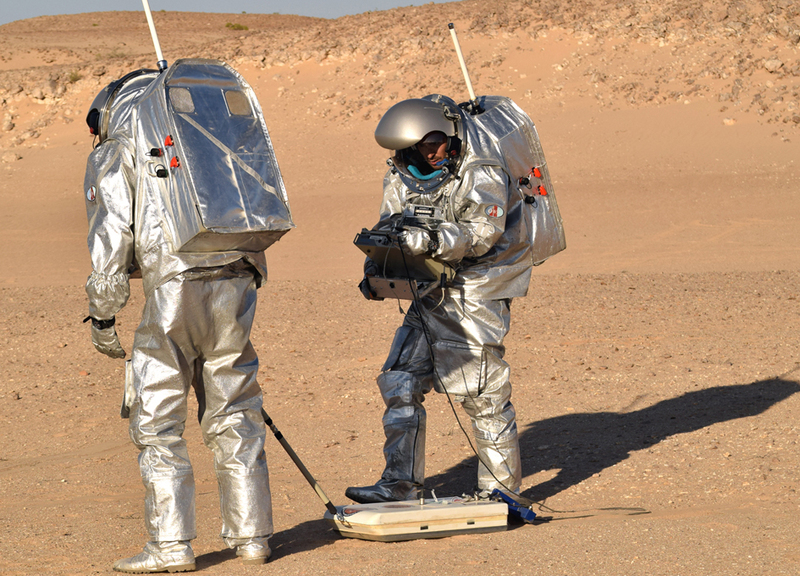 The ScanMars ground penetrating radar has been developed by a group of Italian scientists from INAF's Istituto di Astrofisica e Planetologia Spaziali and the University of Perugia. The radar has an appearance similar to a metal detector, with a pack of instrumentation pulled along the ground at the end of a pole. The radar investigates the subsurface by transmitting and receiving radio-wave impulses into the ground. Regions with different geological characteristics react in different ways to the radio-waves, and enable an image of the subsoil structure and boundaries to be built up from the reflected signals. Led by the Austrian Space Forum, the AMADEE-18 mission aimed to prepare for future human exploration of Mars by conducting experiments in different fields ranging from engineering to astrobiology and from geophysics to life sciences. After being trained on how to use ScanMars at the Austrian Space Forum's facilities in Innsbruck, analogue astronauts tested the radar over four areas in Dhofar with different geologic characteristics. In total, they collected a total of about 70,0000 radar echoes and 1.4 kilometres of profiles to a depth of 5 metres. "The innovative element of ScanMars with respect to common radar fieldwork is that the data was acquired by the analogue astronauts and not the scientists," said Dr. Frigeri. "This means that the astronauts' training has become a key part of the experiment." "The data quality is very good and, even if we are not yet able to distinguish unambiguously the presence of water, we can find alluvial structures that could guide future astronauts to dig where they are most likely to find water," said Dr. Frigeri. "In view of the recent discovery of liquid water beneath the surface of Mars, it's very timely to look ahead to the development of techniques that future explorers could use to analyse the Martian subsurface." The ScanMars radar has a range of applications on Earth and has been used by the University of Perugia to analyse the fault zone involved in the Italian earthquake of Amatrice that took place in August 2016. "Our mission embraced different aspects of scientific exploration and implemented new strategies and workflows for the members," said Dr. Frigeri. "Getting these collaborations right will be extremely precious for future human planetary missions." "The georadar experiment, as part of a carefully designed workflow called the exploration cascade, was a remarkable demonstration of the potential of this method. The exploration cascade determines the sequence of when and which instrument to deploy during a human Mars mission. For future analogue missions, and for the actual first human missions to Mars, this was an important demonstration in a high-fidelity proving-ground environment," said Dr. Gernot Grömer, Administrative Director of the Austrian Space Forum.